We live in a complex world, the days of black and white decision-making are over. And while there is little doubt as to whether or not that complexity exists, the real question is how do we deal with it. The answer to that question, as we will explore in this post, will depend on who you ask, Gen Ys or CEOs. 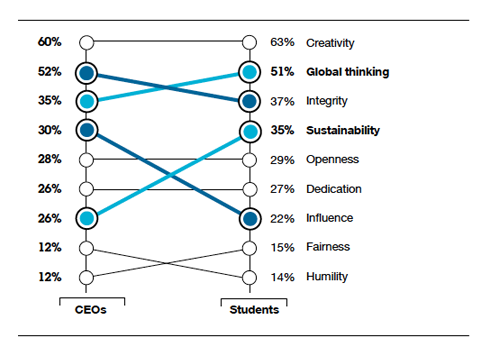 Back in 2010, IBM conducted a survey ‘Inheriting a Complex World: Future Leaders Envision Sharing the Planet.’ It was a global study that compared the insights from IBM’s annual CEO survey with its first ever survey of Students, over 3,600 Gen Y respondents from over 40 countries. 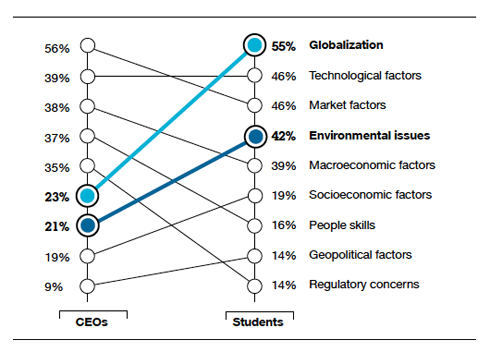 What the study showed was that there exists significant discrepancy between Gen Y’s views and values on the world of business, and those of CEOs. Thus they recognize that the decisions made by a company cannot be calculated in a vacuum and measured only against shareholder wealth creation. The externalities (social, environmental and cultural) must also be taken into account and calculated. What makes this report so interesting is that the qualities described by those in Gen Y are much more conducive to the #NewEraBiz. At the top end, this means creating global companies that generate profits for all stakeholders, act in the best interests of society, and focus on creating genuine relationships with customers rather than viewing them exclusively as profit centres. To reach this level will require a new methodology of leadership, one that fosters creativity, harnesses collaboration and empowers employees. The kicker in this situation is that both groups do not have equal opportunity. The CEOs are the ones with the power, who make the decisions and control the companies that drive our respective economies. Very little has actually changed in the world of business over the last three years at the top level, despite the new ethos that Gen Y brings to the table. Furthermore, it’s been a pretty great last few years for Banks and Fortune 500 Companies. Profits are up, market share is increasing, and governments have given them access to ‘free’ money. Gen Y’s, on the other hand, have seen their fortunes heading in the opposite direction. Youth Unemployment is skyrocketing past historic levels in countries all over the world, while many youth who are employed work for organizations that run counter to their beliefs. This generation has even been labeled by some as the ‘Lost Generation’ to reflect the loss of hope and disparity being seen by young graduates. The real problem is that many Gen Ys are beginning to come to the realization that they will be the ones who are forced to resolve and clean up these problems being created by reckless businesses. One on side, this can be viewed as a great opportunity, but on the other side it is infuriating to witness the destruction from the sidelines. Thus as Gen Y gets ready to ‘Inherit a Complex World,’ the question becomes when will ‘Future Leaders’ get the opportunity to put their talents to the test? At a moment in history when many businesses are beginning to face an existential crisis, and reaching the crossroads where they realize their path is no longer sustainable, it’s time to focus on interconnectivity and sustainability as the drivers of future commerce. For the young Generation, who are born with an inherent understanding of these concepts, the golden opportunity to step up and grab the reins has arrived. And while an awareness and inherent understanding of these concepts may not generate results in the next quarter, they can be used to drive long-term strategies that will enable businesses to survive the transition and thrive in a complex world. It’s part of the move to the #NewEraBiz and will open up a new array of paths for global business in our interconnected world. How do you think we can bridge the Generational Gap between Gen Ys and CEOS?